I recently noticed that I have greatly changed my facilitation methods for circuit blocks. 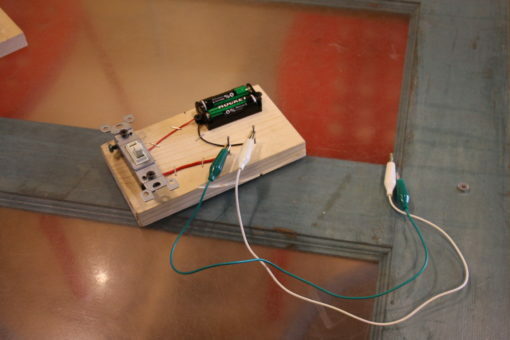 When I first started at MAKESHOP, I ran circuit blocks like a demonstration. I’d show kids how each of the various types of components worked, and then ask if they wanted to play with any of them. This didn’t last long as a style, because a good number of kids would be bored by the end of the experience, or intimidated by the number of instructions. Later, I would talk conceptually for a moment, about how the battery has two sides because electricity has to get out the one side, into a component, and back into the other. I would then talk about wires, and conductivity, and a bunch of other stuff, and the visitors would look at me like I was a martian and just start playing with the blocks. Lately, I just ask questions. What happens if you connect those two nails to these two nails? Why do you think the battery has two wires? What happens if you switch the leads? This works a lot better for older kids. For younger kids, I’ll attach a pair of alligator clips to the battery pack and poke at components, then get them to poke at different components to see what they can turn on. This “Play first, educate second” method seems to be working. At the least, the discoveries belong to the visitors. We’ve also made some changes to the way we frame our power packs. Originally we had bare battery packs on blocks, but people would run down the batteries pretty quickly. Then we had big boxes with arcade buttons on them. They made the batteries last much longer, but visitors didn’t “get” them. Visitors wouldn’t see them as a power source, or would see it and not understand the switch, or would understand that it had a button to “turn on” the electricity but not how the button worked, or how any of the other switches worked. Our new power packs have switches on them, and all of the parts are plainly visible. They show visitors how a switch works, and have helped visitors understand how to use the other switches better. I’m sure we’ll figure out something else to do, but for now circuit blocks are working a lot better! My son and I loved the circuit blocks when we visited the Children’s Museum recently. The pieces seem fairly simple in construction. Could you recommend a resource for building blocks similar to those in the Makeshop? We’re finally retooling the blog, since it needs a lot of love, and I realized nobody ever replied to you about this. As you may have gathered by now, most of the components are from disassembled toys and electronics, mostly from secondhand stores or donations. I don’t think we’ve done a step-by-step, but once the content is back online, try searching the blog for “Circuit Blocks” and you’ll find some process photos. And you can build some with us this summer!